We’ll have to apologise up front, as you were probably hoping for a different answer to this question than the one we are going to give, as you were probably hoping to save money. Boiler servicing costs money and it’s always a shame to spend money without getting a really obvious benefit and keeping something working which was working anyway doesn’t really fit that bill! However, hopefully some of the things we are going to talk about will help financially, as looking after your boiler properly can make a big difference in terms of how long it lasts (and for most people a new boiler is a big expense) and how much it costs to run. There are also a number of useful tips about things you can do yourself to avoid spending money. By far the most important reason for this is safety. Although not all these cases make the news, the NHS believes that around 50 people a year are killed by carbon monoxide poisoning as a result of faulty heating appliances. Carbon monoxide is both colourless and odourless and is almost impossible to detect if there is a leak. However new your boiler may be, it really isn’t worth the risk. It’s not just gas boilers. Carbon monoxide is usually associated with gas appliances, but oil fired appliances can also produce carbon monoxide if not properly installed or maintained. 1. As mentioned right at the start of this article, like most things in life, if they are looked after properly, boilers last much longer. In our experience, it could be 5 years longer. So if a well maintained boiler lasts 15 years, which many do (or even longer), a poorly maintained boiler might only last 10 years, at which point you are facing a big bill for a new boiler. It’s not difficult to see the financial benefit of looking after your boiler properly. 2. 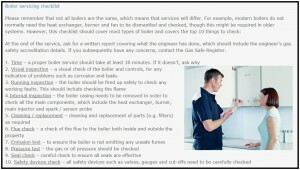 But that’s not the only financial benefit of proper boiler maintenance. The biggest saving is on fuel efficiency. How much do you spend on heating your home every year? The average family in the UK spends over £600 a year or £50 a month. Let’s say proper servicing makes your boiler even just 10% more efficient, that’s £60 a year, not far off the cost of a boiler service already, and 10% could be very conservative. 3. Aside from money, a properly maintained boiler will heat your home better, so it won’t take as long to make it toasty warm after you get home when it’s been off for a while. The boiler will be quicker and quieter to do its job. Right! So you need an engineer to do the servicing. How do you choose one? Sadly, it is not as easy as it really should be. Recently, Which conducted an undercover investigation with hidden cameras to see how well ten different engineers (five from major brands) serviced a faulty boiler. Whether the mistakes were due to laziness or a lack of expertise, they were unforgivable and extremely dangerous. Apart from good recommendations, it’s hard to advise on how to choose a really reliable, high quality engineer who will do the job properly and not cut corners. You should make sure they are Gas Safe or OFTEC registered and then I suggest watching while they carry out the work, as no quality engineer will mind the company (as long as you don’t wear their ears out talking)! What about a maintenance contract? You’ve probably worked this out already, but maintenance contracts end up costing you much more than paying for services and repairs as you go. A contract does help with budgeting and leave you not having to remember to arrange an annual service, however, with contracts generally costing at least £10 a month, they are quite a bit more expensive than an annual service. Which’s research backs this up, indicating that service contracts were more expensive than one offs in over 9 out of 10 cases. To remove the hassle of having to remember the annual service, just ask the engineer to put it into their schedule and remind you when the time comes. Significant repairs and replacement parts are not usually covered by a regular service. Hence, it is worth checking whether your boiler is still under guarantee, which in some cases can be many years, not just 1 or 2. Also, repairs and breakdowns can be covered by household insurance, so again it’s worth a look. If you are not covered and need parts, it is also worth pricing the part online just to be sure you aren’t being ripped off, as many reputable engineers will happily let you source the parts for them if you ask. Obviously you need to be sure you know exactly what you are ordering, that you have ordered all the relevant parts, not just some and that they will be delivered in time, but checking online is a sensible way to ensure you are being treated fairly. 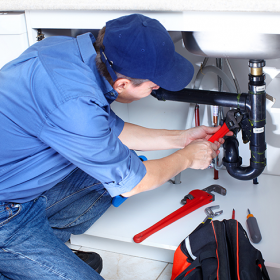 If you are between services and your boiler isn’t working, a good engineer will be quite happy for you to pick up the phone to see if there is anything you can do about it without having to arrange a visit. For example, it is normally fairly straightforward to talk someone through increasing the pressure, re-lighting the pilot light, re-setting the thermostat, bleeding a radiator, etc. It is surprising how many problems can be solved with a quick phone call and some sympathetic advice. Needless to say, if we can help or you have any questions on this article, please pick up the phone or send us an email. We’ll do our best to help!